Thank you for the great information. I agree we need to use good manners on Twitter. One can recognize spam without even reading the entire tweet. Twitter is a great tool, and just like tools, can be misused. But if one tweets responsibly, great friends can be found. I even found a relative in New Zealand! Amazing. This info would have been overwhelming when I first started twitter (though you do a really good job of breaking it down). For anyone reading going uhhhh, save this post, spend a few weeks on twitter, and come back. It will make total sense! What’s a bummer is when a decent hashtag gets gummed up with spam. #YAlitchat is great for the actual chat times, but people use the tag to promo their books the rest of the week. After awhile it’s just noise. So do you only use hashtags that already exist? I think I made up my own for my focus this year #Positivein2015, but I didn’t actually check to see if it already existed. Hope I didn’t just make my self look toolish? I made up #MyWANA. But existing hashtags are where to find readers. You write vampires? Follow #TrueBlood for vamp fans. Write high fantasy? Follow #SOIAF (Song of Ice and Fire) for the Game of Thrones Fans. Write true-crime, suspense or mystery? #DiscoveryID for people who LOVE blood and crime. Great practical advice, Karen. Sharing on Twitter! This allows potential buyers of your product to get to know you, to see how savvily connected you are to your industry, to believe you have a sense of humor and to get the “Oh, she’s got a book! I should buy it!” moment almost as an afterthought. I have spent a significant amount of time unfollowing people who do nothing but promote themselves non-stop and believe me someone must be out there telling folks to do that ’cause it’s getting worse! Have a superb week, Kristen! Thank you, Kristen, I finally understand hashtags. Man! I mean Woman! I read your book “Rise of the Machines.” No failing of your book, as I tend to read fast and not look back, I had not grasped the hashtag thingie. I tried twitter, yup tweetdeck and all, but it left me cold and confused. Ya, I know “check my IQ.” Well, this latest article opened up my mind and greatly added to my understanding. See you, I mean read you, on twitter. No worries, it is why I still blog on social media. Sometimes if I write it in a shorter piece or maybe present the information differently it clicks 😉 . Thanks for the good tips here. It’s amazing to me how many “big” authors on Twitter are tools. I feel so much more connected to the authors who are peeps. And the authors I feel like I connect with seem to try to help new authors, as opposed to making new authors feel small because they don’t do things *exactly* the same way “big” author does. That was a really rambley sentence. I hope that made sense. Anyway, thanks, Kristen, for sharing your knowledge with us! Thank you Kristen!!! I know you’ve left kind messages on the #MyWana feed and still some peeps just aren’t getting it. I hope this helps. When I visit a blog, I like to share the post. It helps me stay active on Twitter while helping that author get their message out into the Twitterverse. But lately I cringe because even though others in kind will RT, they’re loading up the feed by not changing the hashtag. Or, when someone sends a tweet without a hashtag, as you mentioned above, I will add a couple of hashtags in order to best direct that tweet to give it the most attention. It’s really not that hard. And it’s engaging and fun! Again, thank you Kristen! ? I’m a huge fan of social media, especially with how authors can take advantage of it. Here are some really great tips from Kristen Lamb. I have some posts of my own hanging around on my blog if you want to hear my thoughts! You know what’s freaking cool? That your recent blogs just happen to correspond with almost exactly where I am in your book (Normally, I’d read throughout the day and probably be done by now, but BABY). Like, it’s on my to do list to get set up on Tweetdeck today, though I’m still on the fence between that and Hootsuite. Above, Liz Crowe said something that made me sad. Should I really avoid tweeting about politics? I love a good debate! And particularly enjoy hearing opinions from the other side on any particular issue. Maybe you cover that later in the book? It can be troll bait. If you want to talk abut politics in an even way, do that on Facebook. Twitter can really get out of hand and scorch your brand. You have ZERO control, whereas FB you can moderate and make sure people stay on topic and respectful. Twitter? You are asking for a gang to jump you just because they can. Also, politics is something that can tarnish a brand and fracture a platform. Is it worth it? You want to talk politics, do that in FB groups. There is a time and place for it. And, since i know you have my book, remember those somatic markers. Do we really want people’s blood pressure to rise just at the sight of our names? Kristen, the LAST THING I want is people to see “steph mignon” and feel the need to reach for their blood pressure meds/unfollow me because my views differ. Point taken. As always, thank you! I have briefly talked about politics on FB and religion. Usually on someone else’s thread and I do it in a way that is even-handed and non-threatening. But there are times I have to hit the DELETE and remember I am not the Jackass Whisperer. I don’t compromise who I am. If you think all gun owners are terrorists, then don’t befriend me because there is a GIANT pic of me with a sniper rifle. It is very clear I am a Texan, a Christian and conservative. But, I have followers and friends who are gay, transgender, Wiccan, atheist, and on and on. I give people a safe place for community. I am not going to be a drone, and don’t expect you guys to be either. But being transparent versus being on a soap box are different things entirely. And, if we wanted political rants, we would be watching CNN or Fox News, not sharing funny Star Wars memes on FB and talking GF recipes. We are often on social media to ESCAPE the heavy stuff that makes us “feel” angry and powerless. When we offer people what they NEED MOST—REFUGE/LOVE—that is the greatest gift of all. Unless, of course, politics is your brand, and then I would think it would pay to be bold. Bold, as in being authentic, truthful, and raw. While, being respectful, fair, and open-minded. True, but most of the writers in my audience are novelists. And if you make politics your brand, have some seriously fireproof skin. I’ve blogged on Huffington about writing tips and had some of THE MOST HATEFUL and PERSONAL comments. People being cruel just because they can. And this is WRITING TIPS. I don’t have the stomach or constitution for politics, even though my degree was Political Economy of Middle East and North Africa. I could probably write some great blogs, but I ain’t going THERE *shivers*. And what happens is those who write romance or vampire books decide to write something political, then we see the flash and the mushroom cloud and the poor writer crumbles in the wave of ignorance and hate. No need to go there if it isn’t our brand. For those brave enough? I salute you. Wow, this is really great advice. I never thought about changing the hashtags on RTs, but I’ll be sure to do that from now on. I loved what you said at the beginning of your post about people who sell social media services. I’ve seen those people! They offer to blog for authors or post Tweets (for a hefty chunk of change, I might add), but they haven’t blogged in six months. Or their blog posts are riddled with errors. I would be super creeped-out and turned-off if I discovered someone I was chatting with on Twitter or FB was outsourcing. I want to talk to the person I think I’m talking with, not a social media salesperson. I tried to change a hashtag on an RT and the field was not editable. No way to change or delete. ???? What application are you using? TweetDeck or HootSuite? I think this is why I have removed myself from social media, at least from FB and Twitter anyway. In the beginning Twitter was kind of fun – I acquired about 1,000 followers consisting of authors, bloggers, publishers, editors, etc. I followed their MS progress, their ups-and-downs of publishing, but after a couple of years it seems all I see is are the ads for their latest books with a one-liner from the blurb and a link. I do still have about three… yup, just three, authors who still personally tweet about their actual writing. And I love it when they talk about their upcoming book, spoilers and all! It seems too that the rules just get in the way of the fun. Like all of those posts on blogs about the 25 things you are NEVER to post on FB, listing just about anything and everything you would possibly have or want to talk about. I did have to step away from FB though due to the deluge of political rants. I just don’t need that. I prefer now to read up on my favorite authors via their blog/website – I don’t even follow/friend anymore. Too many rules, too little fun. A few of my writer friends have plunged into Twitter and other social media for the sole purpose of promoting their upcoming book or film. They believe it is the key to success and use it relentlessly, posting what they call “bumper stickers” up to three times a day — or more. Over the period they have been wrapped up in this media activity, the writing they produce has dwindled and deteriorated (my opinion). I try to read their tweets now and then but I can’t make sense of it. It takes too much time and effort to stay up to date with them and the stuff they put out is either nonsensical or way too esoteric. Frankly, I can’t see how people who are so busy reading one-liners and expressing themselves in abbreviated code will ever take an interest in spending time with a thoughtful piece of literature, which is what I try to write. So I haven’t engaged in it myself although they keep telling me it is the only way to go. But your friends/colleagues are spamming. They aren’t making connections with people who might like their genre. I only hop on a couple minutes a day and just am there and real. And be careful not to sell audiences short. E-readers and smartphones have more people reading than ever in human history, yet only about 6-8% of the literate population considers themselves to be READERS. But if I write vampire books, and I talk to people who LOVE #TrueBlood enough to want to talk about it on Twitter, how big of a leap is it to assume that the next time they are trapped in a doctor’s office that they might not at least buy my book? Or when they get that new Kindle as a gift? Whose books will they gravitate toward? ALL mega-successful books–50 Shades, Harry Potter, Ya Ya Sisterhood, etc–were birthed from people reading these books who DID NOT NORMALLY READ. So we have to be careful we don’t get elitist and assume that simply because someone is chatting on Twitter, they are too plebeian to read our book. This is comparing apples and oranges. Oh, because someone texts, they therefore will not appreciate literature. A lot of people tweet because it is a break during the day. They use it to stay on top of what is trending and meet people. They may be on a lunch break or stuck in an airport. To make such a simplified assumption about a potential audience is not only a non sequitor, but grossly flawed logic. It would be like me assuming because you read this blog, you aren’t interested in longer works. Make sense? Give the audience credit. They will surprise you 😀 . Since I DID read Rise of the Machines, this was a great refresher for me. I’m still very much a newbie on Twitter. You sent me a gentle correction last week when I screwed up and did exactly what you’re talking about here. I’m pretty sure I RT’d something without changing the #s. My book doesn’t come out until June, so I’ve got five months to get this right and, hopefully, meet a lot of nice people along the way. I wonder if you can point me in the right direction Kristen? Some service is posting tweets through my account and, as a relative noob, I have no idea how to stop it. It irritates me so it’s probably really irritating others. Probably something I may inadvertently done, but maybe not. What service? You can interrupt it (probably) by changing your password. Sometimes we just have to dig, don’t we? 😀 I actually got around to clicking on my Twitter account tab and saw another tab labeled ‘Apps.’ Here I found a list of things that seemed to have been given permission to post from my account. I disallowed anything I didn’t recognize and the problem has stopped. Just thought I’d let you know that in case anyone reading this has encountered the same problem. Ever wonder what’s the deal with #hastags and Twitter? Kristen Lamb explains everything in terms even I can understand. Love, love this post. I’ve been using twitter for just over a year now and still don’t know how the entire hash tag works. I don’t want to overwhelm anyone. I certainly don’t want to be a pain, just a peep. Thanks for this valuable information. You made the hashtag fiasco much easier to comprehend. This is such a great and hilarious information post, Kristen. I have to admit, even though using it regularly for tweeting and re-tweeting, I’m still a Twitter Newbie… any information will help. Thanks, Kristen. I still like a Twitter newbie, I never use hashtags and I can see from this post that I’m missing out by not doing so. I need to get that tweetdeck thing, too. Is there a place where I can find other hashtags? Example: #SciFi, #CozyMystery, #Rejection. Try them and see what comes up. If the hashtag no good, just delete. I recommend looking at your favorite TV shows. Thanks for giving me a place to start that appears to be within my grasp! Now I feel even better about not using twitter. Thanks, I almost considered it. I can confidently add this to my list of things I should never do like watch TV or go to church. Cool. Twitter is powerful for building a platform. It is the single best way to go viral and find readers. The trick is using it PROPERLY. On my list is getting various social media set up for an author friend I am helping. Your advice is going to help me tremendously with that. Thanks! I haven’t started really using Twitter the way I should, and I decided that 2015 will be the year of learning, both Twitter, using social media to benefit me and my support of authors. I’ve been following you for some time knowing you have great information I need to spend time to absorb. This year I also want to work on the craft of writing, I mean really work on it. In 2013 I challenged myself to NaNoWriMo and loved the experience. I haven’t gone back to my first draft to re-edit knowing I haven’t the tools in my tool chest. This year I want to do that. Less reading, less book reviews and more about improving myself. After all, I’m 65 and if I’m going to do something with my love of writing, I should venture forthwith! Twitter for me has been the great unknown of all the social media outlets. The Bermuda Triangle has nothing on the Twitterverse if you don’t have an inkling on how to use it. Safe to say some of my best 140 characters went unheard of as soon as I hit the send button. At least Alice had the company of a rabbit once she reached the bottom of the rabbit hole and entered Wonderland. Thanks to Kristen I will no longer be Alicia Silvestone clueless as I try my hand once again with Twitter. 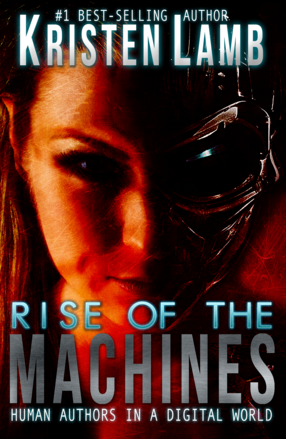 Going to make it a point order your book Rise of the Machines asap. Thank you once again for being one of the most informative blogs ever, keep up the great work. I do pump my blog link out every day. I undid that when I read your book. Then I redid. It really helps out, but now I have to rethink this all again. If you only do it once or twice and no hashtags it’s okay. But look at my post on the Boston bombing. If we suddenly have a catastrophe and then our automated tweet pops up with something cute? Regular people (READERS) don’t know about all the automation tools, so they assume we are being a selfish dirtbag. I scheduled it for 10 so I can check the news first! Of course, today I didn’t get online until 10:01. I hope nothing bad happened. It’s a really good thing to be aware of, and I LOVED your book, though it was very confronting. I eventually absorbed it, though I do have to reread it now that I’ve had nearly a year to adjust. The main thing is thinking tribal. That really gave me hope. It’s a different way of looking at things than the great sea of anonymity. And it’s a way that focuses one’s attention on relationships, which is such a good thing, not to mention realistic. Not being a TweetDeck user (I’ll remedy that ASAP) I didn’t realize simply doing a RT while leaving the hashtag the same can cause problems. Well! See if I ever do THAT again. Thanks, Kristen. What about those of us on Triberr? There’s no way to add hashtags unless you go into each post and change it, but then your visit to Triberr would take hours. Literally like half the day. Each post is shared anywhere from 50-400 times, depending on the quality, by our tribe-mates. Any suggestions? I hate Triberr because it’s automation for the most part. But if you use it, just don’t put hashtags in. Let others add it for you. Triberr almost single-handedly demolished #MyWANA because of the links auto-pumping into the feed. Although I’ve been totally clueless as to how to use the hashtag (until now), Twitter is my favorite social media site. I can converse with so many in a short amount of time just because of the 140 character limit. It’s almost like being in the neighbor coffee shop chitchatting with the people in my neighborhood. Now that I know something about the hashtag, I’ll use it and my tweets will be better. Thank you. Reblogged this on The Phlogisticated Mind. I still don’t get Twitter, but those automatic DMs that tell me to check out their blog/book/music etc. are so annoying. Thanks so much for the twitter information. Can be confusing for old timers. A lot clearer now. Tweet, Help me #MyWANA peeps and we will find you from there :D.
Tweet me at @KristenLambTX and I’ll make sure to get you started. just did!! Thank you so, so, so much!! Why does the Boston Marathon post take me to your wp-admin to edit? I mean I’m denied [a good thing] but the link shouldn’t take me there. No idea. Let me redo the hot link. In the meantime, here it is. Thanks for the great information. I am not very Twitter savy, but I’m trying hard to master Twitter. I don’t use automation and never have. Mostly because I’m afraid of it. 😉 Though, of course, many “experts” say I should be. That I’m doing it wrong by not automating my tweets (or some of them). As far as tactic #3, there are whole groups of people on Twitter who don’t use hashtags. Not that I’ve noticed, at least. Is this not cool anymore or something? I can just hear them through the screen, “Hashtags are like SO last season.” I don’t get it. When I RT and add hashtags, I think I’m offending them. I’m officially uncool or something. 😀 Unbelievable. Phew! Only just getting used to # not being numbers! Good explanation here, though now terrified all my unedited retweets are clogging up the twittersphere. Not understanding technology is mega-aging! Retweeted this 🙂 Great advise (and witty). I am clueless! How do I even retweet and change the tags? Oh my, I’m really not skilled at this. I only just started twitting. It’s not a big hit in Norway, where I’m from, but it seems to be a really nice tool and I keep finding interesting pages and people like you 🙂 Thanks a bunch! Great to meet you! As a weird aside, I just started learning Norwegian because that’s where my family is from. Though the only ones fluent aren’t around anymore. 🙁 If you can speak THAT language? You can RULE Twitter, LOL. Query for you. What about tweet groups? The ones where everyone goes through and tweets the same thing to all their followers. We are talking several hundred tweets per day that are basically about a book for sale? What is your opinion of those?